The purpose of this project is to learn to use your serger and the various stitches, but also have fun with decorative threads. 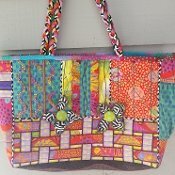 Each panel is decorated using one of the serger stitches; when all the panels are complete, they are serger quilted and serged together to form the bag. Stitches are rolled edge, narrow hem, 3-thread decorative, flatlock, 4-thread, wave stitch, cover stitch, and chain stitch. Techniques include putting in a zipper using a decorative flatlock, using the ruffle foot, crochet lace, flatlock weaving, prairie points, imitation piping, piping, and 3-thread wave. Bring your own Baby Lock serger and threads and learn fun new techniques! Don't have a Baby Lock Serger? We will let you use one of ours.